Standing cup and cover; silver-gilt and enamelled; bowl embossed with fourteen lobes; vertical edge engraved with formal design filled with sapphire, green and ruby enamel; bowl rests on cushion-like base with chased lozenge network; baluster stem with caryatid satyrs, goats' heads and sea-horses; foot with fourteen lobes with scroll border in low relief; slightly convex cover; knob is niello in silver of Lion of St Mark with three seated monkeys beneath; inside is silver-gilt cast medal of Philippe le Beau, father of Emperor Charles V; Eagle of the Empire charged with shield, quarterly Burgundy and Leon with inescutcheon of Austria; ground enamelled red and green; inscribed. Origin: Flemish or, more probably, German; mid-16th century; (on cover) unidentified maker's (?) mark; (on foot) an illegible mark, perhaps over-stamped. (i) On the foot-rim, the mark, possibly overstruck by a second punch-mark, is no longer legible. (ii) On the rim (underside) of the cover, an unidentified maker's (?) mark. This mark has not previously been noticed or recorded but is in an undamaged, albeit marginally incomplete, state. Commentary: When first catalogued in Read 1902, the attribution of this standing-cup and cover was curiously expressed as “Flemish, style of the 16th century”, and this form of words was repeated in Dalton 1927. In Read 1902, it was recorded that it had previously been regarded as Venetian work - no doubt because of the niello Lion of St Mark on the cover and its many other exceptional characteristics. The former attribution was rejected and, in a footnote, it was suggested that “the general design might well be after Matthias Zündt (the Master of 1551)”. However, Read's attribution of the covered cup was to a Flemish workshop - rather than to a German goldsmith in the circle of Matthias Zündt, who was a journeyman in Wenzel Jamnitzer's workshop in Nuremberg in the early 1550s, when he published his 1551 set of engraved designs in his ‘Kraterographie’. He became a citizen of Nuremberg in 1556 and by 1560 he had become a master goldsmith, though his recorded skills as a copperplate engraver and a Steinschneider (a hardstone or gemstone engraver) were probably still very much in use. Read's preference for a Flemish attribution seems to have been based on his incorrect identification of the medal (set in the cover of the cup) as that of “Philippe le Beau, the father of the Emperor Charles V”. Philip the Fair, Duke of Burgundy (1479-1506), died thirteen years before his father, the Emperor Maximilian I (reigned 1493-1519), and the Flemish cities were the richest part of his Dukedom. 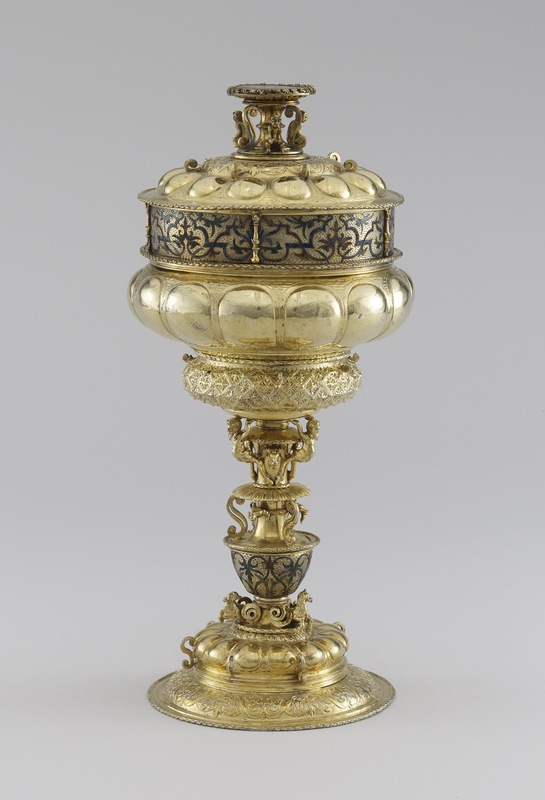 The design and decoration of this standing covered cup are not consistent with a date of 1506 or earlier. Indeed, the obverse of this medal is known and depicts Ferdinand I, Archduke of Austria (later Emperor Ferdinand I, reigned 1556-64) on horseback in tourney-armour riding to the left, encircled by the inscription: FERDINANDVS . DG . ROM . HVNG . BOEM . DALMA . CROA . REX ., and the date 1541. A struck original was in the 1911 auction sale of the Lanna Collection (see ‘Sammlung des Freiherrn Adalbert von Lanna’, Prague, III, Coins and Medals, R. Lepke's Kunst-Auctions Haus, Berlin, 13-19 May 1911, lot 670, pl. 35). Though not common, another silver example, cast after a struck original, is preserved in the Kress Collection (see G. F. Hill, ‘Renaissance Medals from the Samuel H. Kress Collection at the National Gallery of Art’ (rev. and enlarged by G. Pollard), London, 1967, p. 118, no. 621). The reverse of both the Kress and the Lanna Collection examples is exactly the same as that inserted into the underside of the cover of this standing-cup. The 1541 medal of Ferdinand I is significantly closer in date to the period to which, on purely stylistic grounds, the covered cup would be attributed. Furthermore, as a Germanic origin for this standing-cup is perhaps to be deduced from the decorative evidence, the future attempts to identify the maker's (?) mark should be extended to include a full-scale survey of German as well as Flemish silver marks. Furthermore, at this stage, the significance of the medal within the cover cannot be assessed since there is no way of detaching it and analysing the method or technique used for fixing it in position. If it is an integral part of the method by which the nineteenth-century finial and its modern niello of the Lion of St Mark are attached to the cover, then it is more probable that its 'marriage' to the cover is also modern. Since the armorial device on the medal is enamelled in colours that resemble those used on the two zones of the cup (the bowl and the stem) there are grounds for striking a note of caution about the latter, though the pattern follows closely designs published by Matthias Zündtin 1551 (see ‘Wenzel Jamnitzer’ 1985, p. 373, no. 374). Again, the stem can no longer be taken apart and each element examined; consequently, it is not possible to say if the enamelled body of the vase-shaped element of the stem is original. It certainly does not fit happily on top of the seahorses section at the base of the stem, but perhaps another intermediary element is missing. Similarly, there is a disturbingly feeble quality about the s-scroll brackets and, more particularly, the six baluster columns that form an integral part of the design of the enamelled zone below the rim of the bowl. However, the same lack of quality, especially in the comparable details, can be observed on the famous early Renaissance silver-gilt and enamelled Reliquary of François de Châteaubriand in the Treasury of the Basilica of Notre-Dame-de-1'Épine, Évron (Mayenne), which was made by an unidentified goldsmith of Angers, known as 'le maître à l'oiseau' from his punch-mark (see ‘Les trésors des églises de France’, exhibition catalogue, Musée des Arts Décoratifs, Paris, 1965, p. 134, no. 251; also M. Jacob, Les orfèvres d'Angers au XVIe siècle, in ‘Hommage à Hubert Landais’, Paris, 1987, p. 147, fig. 5 in colour). This reliquary, apparently made to replace the one stolen in 1508, would not have been commissioned until after 1515, when the Abbé de Châteaubriand returned from Rome with an alternative holy relic, the Milk of the Virgin. It is not known when this silver-gilt reliquary in the form of a Renaissance baldacchino was finished – “vers 1516”, according to the 1987 publication - but many of its details are, indeed, characteristic of that transitional phase when Italian Renaissance designs were being adopted by local goldsmiths north of the Alps without complete understanding or great confidence. The same hesitancy may be detected in the handling of these Renaissance details on this covered standing-cup in the Waddesdon Bequest. The 1551 designs of Matthias Zündt and of his contemporary Virgil Solis (1514-62) - mostly signed but undated - include many of these incredibly fussy sculptural details, projecting at all angles from the piled up horizontal zones of the standing-cups (see J. F. Hayward, ‘Virtuoso Goldsmiths and the Triumphs of Mannerism 1540-1620’, Sotheby Parke Bernet Publications, London, 1976, p. 351, pls 133 and 136-7 for three typical examples preserved in the Victoria and Albert Museum). The first of the three designs is a pen and wash drawing attributed to mid-sixteenth-century Nuremberg; significantly, it contains crockets on the foot and, at the foot of the stem, little horned crouching animals, while above there are standing caryatid satyrs - albeit not identical, but having much of the same character as those on the Waddesdon covered cup. The same drawing has, beneath the bowl, a cushion-like zone with an interlacing lozenge pattern filled with a chased pattern of flowers and fruit; although less like the late Gothic architectural examples, it nevertheless gives a similar visual effect of a network. For two strongly architectural examples of 'about 1520', see the knops on two Spanish chalices with round bosses at the intersections and a finely pierced tracery in the triangles (not lozenges) (Charles Oman, ‘The Golden Age of Hispanic Silver 1400-1665: a catalogue of the collection in the Victoria and Albert Museum’, London, 1968, p. 10, no. 28, pl. 39, figs 69-70). The same network motif is employed below the bowl of Zündt's 1551 engraved design (Hayward 1976, pl. 136), where several of the tiny projecting sculptural forms have the same fantastic, almost weird Mannerist quality as on the Waddesdon standing-cup. The unexpected use of crockets can also be found in a pen and wash drawing of a standing cup preserved in the Staatsarchiv, Nuremberg (Hayward 1976, p. 349, pl. 115). It is recorded in a seventeenth-century inventory as a drawing of a cup (set with precious gemstones) presented to the Emperor Matthias in 1612 after his coronation at Frankfurt; like so many presentation cups, it was probably more than fifty years old at the time, but worthy of the occasion because of its weight, size and the value of the gemstones. On its cover and stem the crockets can be detected, along with the projecting rams' heads on the stem. Among the few comparable extant cups is the marked Strasburg covered cup (in the Schweizerisches Landesmuseum, Zurich), reputedly presented in 1560 by Queen Elizabeth I of England to the Zurich pastor, Heinrich Bullinger, in appreciation of his generous assistance to English Protestant clergy who during the reign of Mary Tudor (1553-8) sought refuge in Switzerland (see R. Sänger, Gold- und silberschmiedekunst , Bergkristall- und Steinschneidearbeiten, ‘Die Renaissance im Deutschen Südwesten’, exh. cat., Heidelberg Castle, Badisches Landesmuseum, Karlsruhe, 1986, p. 643, no. L. 50). Although the Strasburg maker's mark has not been identified, this mid-sixteenth-century German piece, with its very similar overall appearance and its identical use of embossed plain lobes against a ground of dots (or short dashes) in horizontal lines, is a typical austere version, lacking the Mannerist applied sculptural details, and “shows strong Nürnberg influence” (Hayward 1976, p. 364, pl. 285). It can be compared with the pen and wash drawing of a covered cup attributed to “Nürnberg, um 1530-40”, preserved in the Germanisches Nationalmuseum, Nuremberg (see ‘Wenzel Jamnitzer’ 1985, p. 338, no. 292). dating of the Waddesdon covered cup is the one that can be made with the covered cup enriched with bands of enamelling (red, green and blue) and preserved in the Museo Civico, Padua (H. Kohlhaussen, ‘Nürnberger Goldschmiedekunst des Mittelalters und der Dürerzeit 1240-1540’, Berlin, 1968, pp. 475-7, fig. 676); it is dated 1534 on the medallion under the cover, and there is an almost identical undated covered cup in a private collection in Switzerland (Hayward 1976, p. 363, pl. 278). Not only are they both attributed to Nuremberg, c. 1535-40, but they are thought to come from the workshop of Melchior Baier (master 1525, died 1577). Again, the embossed lobes are seen against a background of horizontally arranged dots or short dashes, and the uppermost zone of the bowl is a similar broad vertical band, divided from the middle zone by several mouldings. The absence of any applied Mannerist detail is to be expected in the late 1530s, probably at least a decade before the Waddesdon covered cup was made, but the gradual embellishment of established Nuremberg types with Mannerist sculptural ornament was part of the trend, under the influence of Matthias Zündt, that swept through the workshops of Nuremberg in the middle decades of the century. The evidence surviving from the Flemish workshops is sadly so diminished by the grievous losses of past centuries that, at present, there is a strong temptation to abandon the former attribution (in Read 1902 and Dalton 1927) and propose an attribution to a Nuremberg workshop in the late 1540s or early 1550s, when Matthias Zündt's engravings, with their penchant for applied Mannerist sculptures, especially those emaciated satyrs, were contributing to a change in fashion (see ‘Wenzel Jamnitzer’ 1985, p. 373, no. 373, where the caryatid satyrs on the short stem of the covered cup are very similar to those on the Waddesdon enamelled piece). This London cup is, undoubtedly, a most important transitional piece, which may mirror faithfully the prevailing compromise between old and new ideas among Nuremberg's leading goldsmiths around 1550 but might equally be the product of a leading Flemish workshop a decade or more earlier. Confirmation of the popularity of the same applied Mannerist sculptures (seahorses and caryatid satyrs) in Antwerp silver can be seen on a rare survival - the Founder's Cup of Emmanuel College, Cambridge, which is unquestionably the finest contemporary piece of Antwerp plate in Britain (for a further discussion see WB.89-WB.90). Equally striking is the similarity between the broad bands of chased foliate ornament (on the foot and the cover of the London cup) and on the neck of the Aspremont Lynden ewer (WB.89), another documented piece of contemporary Antwerp silver plate. Finally, there is the telling but highly controversial evidence of the very large coloured drawing (for a tall covered standing-cup) acquired in 1667 for Louis XIV's ‘Cabinet du Roi’ (see J. Adhemar in ‘Collections de Louis XIV’, Paris, 1977, exhibition catalogue, p. 137, no. 113, with illus., for a discussion of the initials P.F. (a signature?) and of the tentative attribution to Antwerp, c. 1540). Hugh Tait, 'Catalogue of the Waddesdon Bequest in the British Museum, II : The Silver Plate', British Museum, London, 1988, no. 6, pl.VI, figs. 25-29.